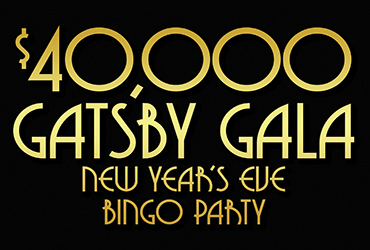 Celebrate New Year’s Eve at Rampart Bingo with our $40,000 Gatsby Gala Bingo Party. The all-day event features 4X $1,000 Coveralls every session and $25 free bingo play to all single players. Earn 100 points in Bingo to swipe at the kiosk for a FREE entry into the $79 Gatsby Gala New Year’s Eve Buffet. With seatings at the 2 pm, 4 pm, 6 pm, and 8 pm seatings only. Plus, at the 11 pm session enjoy party favors and champagne.